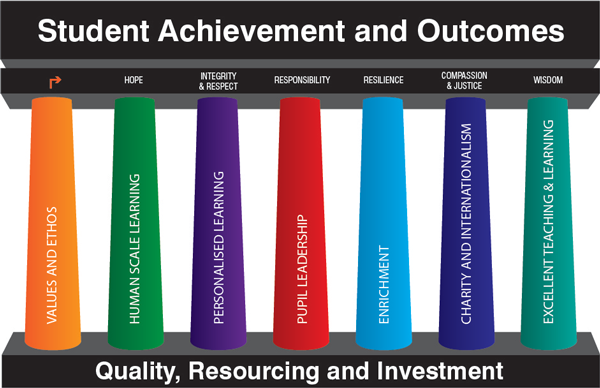 The Trust has developed seven key principles or pillars that form the foundation of our school design. All our schools must embrace a strong set of values which ensure that pupils learn how to take their place in modern Britain. Our schools develop environments where children and young people are valued as individuals. We believe that the primacy of relationships should inform the design of schools within the trust. We believe that the quality of learning is shaped by learners’ experiences, characteristics, interests and aspirations. This means that all our schools take a structured and responsive approach to each learner in order to ensure that their needs are met. This means that all pupils will engage in explicitly assessed leadership skills from Key Stage 2 in order to engender responsibility. All our pupils will engage in sporting, artistic or other activities outside mainstream lessons in order to build confidence. This means that all pupils will engage in international trips or visits, charity work or enterprise activity. This means that teaching in all our schools will become consistently good or better. We also ensure coherence across the key stages. Education should be a personal journey which the learner can shape. All too often, it feels like a series of loosely connected key stages, attainment outcomes and year groups that the learner only vaguely understands. Our aim is to ensure a coherent and harmonised educational journey for pupils especially at transition. This happens through the application of the mini baccalaureate at Key Stage 2, the mid baccalaureate at Key Stage 3, the modern baccalaureate at Key Stage 4 and the sixth baccalaureate at Key Stage 5. This integrates the academic and broader life and employability skills through a nationally accredited certificate.